EU and US Antitrust Arbitration is the first book that deals with how both of the world's leading antitrust systems, US and EU law, are treated in international arbitration. In forty-nine chapters written by renowned experts, this book provides an in-depth examination of all relevant topics, from drafting arbitration clauses, to arbitrability, provisional measures, the applicability of antitrust law in arbitrations, dealing with economic evidence and experts in relation to antitrust law, to relations with courts and regulators, remedies, and recognition and enforcement of arbitration awards dealing with antitrust issues. Both antitrust and merger control are covered. The perspectives of the arbitrator and the in-house "user" of arbitration are included. 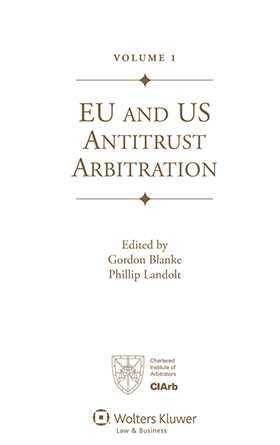 Two chapters outline and explain US antitrust law and EU antitrust law with special reference to matters particularly likely to arise in arbitration. One chapter is devoted to ICC antitrust arbitrations and another to the emerging area of EU State aids in arbitration. There are industry-specific chapters, such as on telecommunications and pharmaceuticals, and much else. In this substantial book, practitioners will find helpful and easy-to-understand guidance to their questions on antitrust arbitrations. Part II EU Competition Law.